The bladder press is a lovely piece of equipment. below the juice channel, you can see the hook-up for the garden hose. After three years and more of work and study, we’re close to our first harvest. We started in 2010 with our first classes on viticulture at Piedmont Virginia Community College, and moved on to researching and ordering vines in early 2011. We’ve spent three y ears nursing those vines along, and now some of the varieties – the Viognier especially – are only days away from being ready to pick. (With the rest a bit further behind.) And for all the time we’ve had to think about these things, found myself scrambling in these last few months to make sure I knew what I was doing and had the equipment to do it with. In some ways, assembling the small items – the yeasts, the beakers, the malolactic bacteria and the like, which I discussed in my last post – was the easiest part of assembling a home winery. Those items mainly required research and an hour or so on the More Wine site. The big items – the crush-destemmer, the bladder press, and the barrel room – though few in number, posed the biggest challenge. 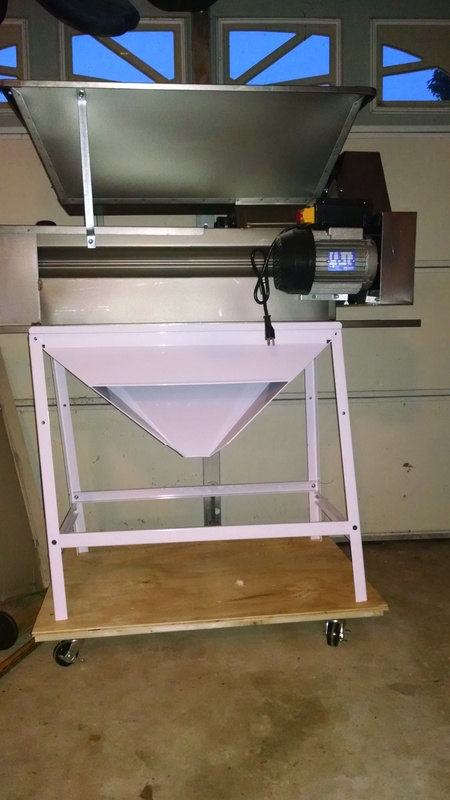 Because they were the most expensive items I ordered, I spent quite a bit of time agonizing over the crusher and press. There are lots of choices at very different price points, and I wanted to order equipment that would be adequate for the task without going overboard. The crusher destemmer has two tasks. First, it gently crushes the grapes, so that, in the case of reds, they are ready to begin fermentation, and, in the case of whites, they are ready for the press. Second, it separates the stems (which contain bitter tannins) from the grapes. The stems fall out through one side of the crusher-destemmer into a bucket, and the grapes and juice fall into a fermenter. Crusher-destemmr on its stand. I built the wood dolly with plywood, 2×4 lumber and 3 inch wheels. I would have preferred that it work in the opposite order, first so that there’s no risk of the stems being crushed, and second, so that the two processes could be separated allowing me to destem without crushing if I chose to. But that’s a whole different price range, and all in all, I’m pretty happy with the motorized, stainless-steel machine I purchased. I did wonder briefly if it was overkill for the quantity of grapes I’m likely to be processing, but I tell myself that it’s an investment in the future. Yeah, that’s the ticket, an investment in the future! I also ordered a bladder press, which is used to press the juice off the skins and seeds of the grapes. The bladder press is pricier than the more traditional-looking basket presses (think wood stave sides and a ratchet handle at the top that is turned to push down a plate to squeeze the grapes), but all of the literature I’ve read suggests the bladder press is a much better choice. 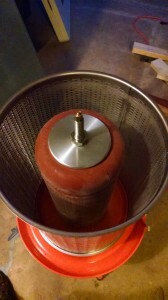 The bladder inside the press fills with water from a garden hose to expand gently, pressing the grapes against a screen that lets the juice flow out, while the skins are kept inside. It’s actually quite a beautiful piece of hardware. After I unpackaged the crusher-destemmer, admired it, let it sit on the shipping pallet for a couple of weeks (it’s really heavy), I came face to face with a small mistake. I hadn’t ordered a stand for it, reasoning that I could use sawhorses or something similar to hold it high enough to let the crushed grapes fall into a fermenter. Inside the bladder press – the bladder at the center fills with water and expands to gently squeeze the grapes. Well, not quite. It turns out the crushed grapes fall through the entire length of the bottom of the crusher, and need to be funneled into some kind of container, either a small fermenter or buckets to carry the grapes to a larger fermenter. 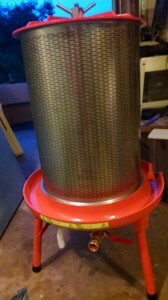 So, I turned back to MoreWinemaking, which is where I bought the crusher to see about a stand. It cost $325, which isn’t terrible, but it would have cost nearly as much to ship it, since it has to go by truck. That just seemed wrong, somehow. 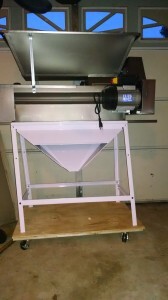 I had paid one shipping cost for both the crusher and bladder press, and while the shipping was expensive, it was still only a fraction of the cost of the two pieces of equipment. In the case of the stand, I just couldn’t bring myself to pay as much for shipping as for the item itself. So, I tried other vendors, and the story was the same everywhere, until I stumbled across Carolina Wine Supply. They were willing to ship it UPS or FedEx, unassembled in a flat box, for something like $25. Definitely a company I’ll be doing more business with. For what it’s worth, having equipment shipped by truck isn’t exactly a trouble-free process. They really want to ship to businesses with loading docks, not to suburban homes, and the cost goes up significantly for the latter. Moreover, they expect you to make arrangements to be there when they arrive, which can be difficult because they don’t always provide much advance warning. I was able to bargain with the trucking company to leave the items on my driveway while I wasn’t home, which worked after a couple of false starts, but it did mean I waived my rights to inspect the items for damage. Well, you work with what you got. At some point over the summer, I began to wonder where I would store the wine while it was fermenting and aging. Once the initial fermentation is complete, the wine goes into glass carboys for secondary fermentation and, later, for aging. I have quite a number of glass carboys, and it occurred to me that spreading them across the garage wasn’t practical. A six gallon glass carboy is heavy to begin with, but once full, it weighs an additional 48 pounds, so moving a full carboy around is physically demanding and mentally harrowing. If it slips from your hands and breaks, you end up with a garage full of spilled wine and broken glass. Not good. Still under construction, my garage “barrel room” will hold at least 15 six-gallon carboys of wine. So, I’m constructing a garage “barrel room” that should be large enough to hold 15 six galloncarboys on three shelves, plus either large plastic fermenters, small oak barrels or more carboys on the floor. 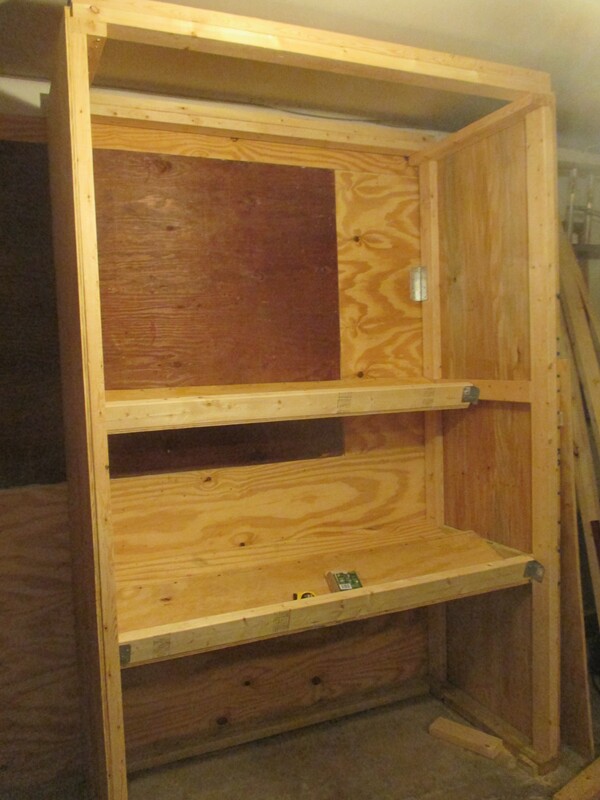 The shelves are installed at a 15 degree angle, which makes it easier to insert a wine thief or racking cane into the back shelf. By using a pump to move wine, I’ll never have to lift a full carboy. The very top shelf will hold an assortment of one gallon jugs, supplies etc., and a 5,000 BTU air conditioner mounted near the top will keep it cool inside. I have most of the inside finished, but need to build the doors and mount the air conditioner. I’m pretty pleased with the way this home “barrel room,” looks, and I have to credit Steve Hughes’ book,The Homebuilt Winery. The book includes the plans, but fair warning, the average person will probably want to spend some time studying and interpreting the plans. I’ve done a lot of home construction projects in my time, and I have a pretty complete workshop, but I still found some parts of these plant to be a chore to figure out. So, while I like the book a lot, I wish it had provided a bit more detail for some of the projects. However, the idea for the barrel room was worth the cost of the book, and the plans were adequate to get me through the project. The book also gave me the inspiration to build a dolly to move the crusher-destemmer around, and there are a few other projects that I might eventually take on. For the really ambitious, he shows you how to build your own ratchet press and destemmer, and a dozen or so other things. All in all, it’s a book I’d recommend for the aspiring Garagista. Well, I haven’t. At least not yet!